For the western church, yesterday — Ash Wednesday — marked the beginning of Lent, a penitential season in preparation for Easter. Basically patterned on the Gospel stories of Jesus’ fast and temptation in the desert (Mt. 4:1-11; Mk. 1:12-13 and Luke 4:1-13), Lent is usually counted as 40 days, sometimes with some creative calculations involved. For some of CNEWA’s partners who are Orthodox, the preparation for Easter this year does not begin until Monday 19 February, which is the beginning of the Great Fast. Fasting is something common to almost all the religions of the world. It is connected often with asceticism — those practices which help the believer overcome the drives of the body and elevate the spirit to a higher reality. However, for members of monotheistic religions who believe in the one God — Judaism, Islam and Christianity — fasting plays a central and important role. Again and again in the Hebrew Scriptures we find the Israelites proclaiming a fast to atone for some transgression or to avert some tragedy. The biblical book of the Prophet Joel revolves entirely around a period of fasting and repentance. It seems that a plague of locusts had attacked the land and was devastating the crops. Joel compares the locust to an army of countless warriors, devouring the land and hurling the people into a deadly famine. Joel exclaims “order a fast, proclaim a solemn assembly!” (1:13; 2:15) God calls the people to repent, “..come back to me with all your heart, fasting, weeping, mourning...” (2:12 ff.) Fasting and repentance are outward signs of an inner conversion to the justice which God demands (Isa 58:5-7). Fasting focuses the spirit and purifies prayer throughout the Hebrew Bible. The tradition continues to this day; for contemporary Jews the Holy Day of Yom Kippur, the Day of the Atonement, is a day of fasting, prayer and repentance. For Muslims, fasting also plays a major role. The holy month of Ramadan is the month of fasting. For a lunar month, Muslims observe a total fast in which nothing enters the body. Whereas Christian fasting does not include water, Muslims go further; they abstain from food, water, smoking and sexual activity from sunrise to sunset during the month of Ramadan. Unlike the case with Judaism and Christianity, Muslim fasting during the month of Ramadan does not have a strong penitential element. For Muslims, the fast of Ramadan is rather a joyful thing — an act of self-control, to be sure, but also primarily an act of worship to God. Finally, in the New Testament fasting plays an important role and is connected for Christians with penance and prayer. Fasting here understandably has roots deep in the Hebrew tradition. And it is mentioned with surprising frequency. We tend to overlook how often people in the New Testament are presented as “praying and fasting.” It is so common that it is almost self-evident and often mentioned merely in passing. In Luke, the prophetess Anna spends her time in the Temple with “prayer and fasting” (Lk 2:37). In 2 Corinthians, Paul reminds his readers of the times he has spent praying and fasting (2 Cor 6:5; 11:27). Simply assuming that his followers will fast, Jesus warns them against making an outward show of their fasting (Mt. 6 passim). Although it is often overlooked, fasting in both the Old and New Testaments is closely connected with acts of charity and justice (see especially Isa 58). For Christians, then, the fasting of Lent has several levels of meaning deeply rooted in the Scriptures. Outwardly fasting is an act of self-denial and self-discipline. But it is far more than just self-discipline. It is an act of stripping away the non-essential and focusing on what is central. It focuses inward, as the believer focuses on God and the act of God in Jesus Christ. And focusing inwardly on the saving act of God in Christ, the Christian is impelled to focus externally to bring about the Kingdom of God proclaimed by Jesus — a kingdom of justice, peace and compassion. Staffan de Mistura United Nations and Arab League Envoy to Syria speaks during a Security Council meeting on the situation in Syria at the United Nations on 14 February 2018. The presence of Capuchin Franciscan missionaries in Ethiopia goes back to 17th century, when the first two French Capuchin missionaries, Father Agathange and Father Cassien, planted the seed of faith, and nourished it by shedding their blood and giving their lives within two days of arrival in Gondar from Egypt in 1638. Later, the legendary Italian Capuchin, Cardinal Guglielmo Massaja (1846-1880), helped create the Oromo Vicariate in the western part of Ethiopia and expanded Catholicism in the country. In the later days, a group of French Capuchin Missionaries followed. The growth of the Catholic church and Catholic faithful is due to the presence of these missionaries who devotedly paid with their lives. These true evangelizers reached out to the remotest corners of the country — erecting churches, establishing schools, providing health services and witnessing to the faith with their simple way of life. After decades of devoted work and growth, on 10 February the Capuchin Friars Minor Vice-Province of Mary Kidane Meheret in Ethiopia was raised to the status of Province. The celebration took place at Gulele St. Francis Parish Church, with a Mass presided over by Cardinal Berhaneyesus D. Sourapheal, Metropolitan Archbishop of Addis Ababa, attended by Msgr. Luigi Bianco, Apostolic Nuncio to Ethiopia and Djibouti, the entire local Capuchin Franciscan friars, along with other invited religious congregations. In Ethiopia, the Capuchin Franciscans serve in eight church jurisdictions (three Eastern rite Eparchies and five Latin Rite dioceses) in 20 community houses. Besides the focus on evangelization, the Capuchins run five highly respected Catholic secondary schools in Baher Dar-Dessie Eparchy and in Soddo vicariate, along with the Abune Andreas Girls’ Home in Dire Dawa. They also run many junior and primary schools; a boarding facility for boys in Dessie; and they also support a university chaplaincy programs. One of the secondary schools — Abba Pascal Catholic Girls’ School (named after Father Pascal, a French Capuchin missionary) in southern Ethiopia in Soddo vicariate — was established for educating rural girls. Most of these services were initially located in the most remote parts of the country. CNEWA partners with Capuchins in Ethiopia, supporting five of these remotely located schools and the Girls’ Home in Dire Dawa, thanks to our generous donors who sincerely value the services of these missionaries, who continue to witness to the faith through simple lives of evangelization. By supporting these zealous missionaries for the good of the local church in Ethiopia, let us be part of that journey before them — accompanying the local church through the efforts of the Capuchins! Below, you can see a brief video of some of the friars joyfully singing a hymn of thanksgiving during the Mass. Last week in Eritrea, priests, religious and lay people associated with the work of St. Vincent de Paul celebrated the 400th anniversary of the beginning of the Vincentian movement. It was in 1617 that St. Vincent began his outreach among the poor, through the Daughters of Charity. He organized wealthy women of Paris to collect funds for missionary projects — and from that humble start the Vincentian family grew into a worldwide charity. We’re pleased to share some images from that event — along with our congratulations and prayers of thanksgiving on this wonderful occasion. St. Vincent de Paul himself spoke movingly of service to the poor — and his spirit and charism continue to inspire Vincentians everywhere. At the Monastery of St. Francis of Assisi in Bayada, north of Beirut, faithful gathered for Ash Monday Mass in the chapel on 12 February. In the Maronite Catholic Church, ashes are distributed on Monday, two days ahead of the Latin rite’s traditional Ash Wednesday distribution. This allows Catholics to observe 40 days of Lent, but also celebrate two church feasts for which fasting is not required: the feast of St. Joseph and the feast of the Annunciation. “To change our character, it is difficult, but we ask God for the grace to be able to fast,” Melkite Father Nidal Abourjaily said in his homily before distributing ashes. “Fasting will help us to grow closer to God as we unite our sufferings with him, and this is the most important thing,” said Father Nidal, a Franciscan Capuchin and superior of the monastery. Typically, in Lebanon, Catholics follow the recommendations of their respective rites regarding their fast for Lent. The Maronite Church, for example, asks for fasting daily from midnight until 12 noon, and abstinence from meat and dairy products for those in good health. Sundays are not considered days of fast or abstinence. “All fast, in some way,” Father Nidal told Catholic News Service of the faithful — a blending from Catholic rites, including Maronite and Melkite as well as some Roman Catholic — who attend St. Francis. Berthe Obeid, a Melkite Catholic, told CNS she fasts until noon and sometimes until 3 p.m.
“I like chocolate and nuts, so I try to stop eating those as well,” said Obeid. “It’s not so difficult when I know I am doing this for the Lord. I want to do something to please him, to be near him, so he gives me more strength to do it. Lent is a time to draw closer to God, to leave the things that can pull us away from him,” she explained. “Looking back over the years, I can see now how I’m growing in my faith because of Lent,” Obeid added. During Lent, Myrna Chaker, a Maronite Catholic, will be fasting each day until noon and will abstain from dairy and meat. “When I give up material things, it helps me more in the spiritual life. I should forget myself during Lent and focus on how to help people and how to show more and more love. I want to offer up this Lent more for the people around me,” Chaker explained. Aside from fasting, Chaker said she tries to devote more time to prayer and to attend Mass every day as well as eucharistic adoration. “I ask God to use me as an instrument,” she noted, adding that social media offers an opportunity to share Scriptures, prayers and inspirational tidbits to encourage others in their Lenten journey. Joseph Haddad, a Melkite Catholic, is a self-described cheese addict, but said he will not eat meat or dairy products during Lent. Haddad said he would intensify his fast during Holy Week. For three days, beginning on Holy Thursday until noon on Holy Saturday, Haddad fasts completely, taking only occasional sips of water. Pope Francis and Patriarch Youssef concelebrate Mass in the Casa Santa Marta. 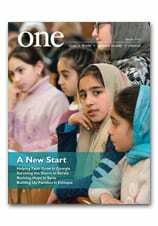 In the current edition of ONE, journalist Magdy Samaan chronicles the remarkable story of the Daughters of Charity in Egypt. Here, she adds some personal reflections of her experience covering the story and meeting the sisters. Alexandria is a beloved city for Egyptians. Once, it was the main destination for summer holidays vacationers. Everyone, especially the older generations, keeps happy memories for the city. For me, it was the city where I saw the sea for the first time — a stunning memory. I have written many stories from there, but most of them were sad — covering the demolishing of a villa or the sectarian tension between Muslims and Copts. But during my most recent visit to Alexandria I had the chance to write about something positive: The Daughter of Charity a Catholic community of women serving in Egypt since 1844. The Daughters of Charity in Alexandria manages the Saba Banat dispensary and St. Vincent de Paul School. After I finished my interview with Sister Simone Abdel Malek, the superior of the community and the manager of the dispensary, I asked her to go with my colleague, photographer Roger Anis, to speak with some patients, who were waiting in the hall outside her office to see doctors. She suggested coming with us. “They will feel safe when I’m with you,” she said. Sister Simone walked with us in the long hall. With a kind smile, she asked the people if we can interview them and take pictures. Her presence made our job easier because the people trust her. When we visited the place again, Sister Simone was out of the country, and we had to do the interviews without her help. Not everyone wanted to speak. For me, it was impressive how five religious sisters are able to run such big ministry. But as I talked with them, I learned that they depend on a tradition of more than 170 years; they have earned respect and trust across many decades. One of the people I met in Saba Banat is Mohamed Goda, a 41-year-old farmer, and his wife, Aliaa Ibrahim. Mr. Goda is a conservative Muslim. He talked with a lot of gratitude about the dispensary which helped him to treat his two-year old son. The workers of the dispensary and the school do not ask anyone about their religious background, and those who come seeking the services leave any religious prejudice outside the doors. The situation at St. Vincent de Paul School was similar. Sister Eman Fawzy, the manager of the school, shows patience and firmness — but her firmness doesn’t conflict with the spirit of the Daughters of Charity, whose work is based on love for the poor. It was not only the tradition and the trust that helped the sisters; they were also equipped with education. Each sister has a degree or two in her field of service. The local community treats them with respect and trust — and people seem to know the sisters are raising the standards for everyone. A mother of a student in the school told me that her family relocated to a flat nearby when her son was accepted as a student there. She did it because she knows he will get a good education. She believes any sacrifice will be worth it. Read more about Charity’s Daughters in the December 2017 edition of ONE. And watch the video below for a personal glimpse of the sisters at work.